Uric acid is the final product of all purine bases. Roles of the enzyme xanthine oxidase and its products. Uric acid (or urate) is a heterocyclic compound of carbon, nitrogen, oxygen, and hydrogen with the formula C5H4N4O3. In humans uric acid is the final oxidation (breakdown) product of purine metabolism. Uric acid is formed primarily in the liver and excreted by the kidney into the urine. During purine metabolism, guanosine monophosphate (GMP) is split into the base guanine and ribose. Guanine is deaminated to xanthine. Similarly, adenosine monophosphate (AMP) is deaminated by the enzyme AMP deaminase to inosine monophosphate (IMP) from which the ribose unit is removed by the enzyme xanthine oxidase to form hypoxanthine. Xanthine, is oxidized by oxygen and xanthine oxidase with the production of hydrogen peroxide and uric acid. This last reaction is irreversible. In man, the urate is excreted and the hydrogen peroxide is degraded by catalase. Xanthine oxidase is present in significant concentration only in liver and intestine. The pathway to the nucleosides, possibly to the free bases, is present in many tissues. 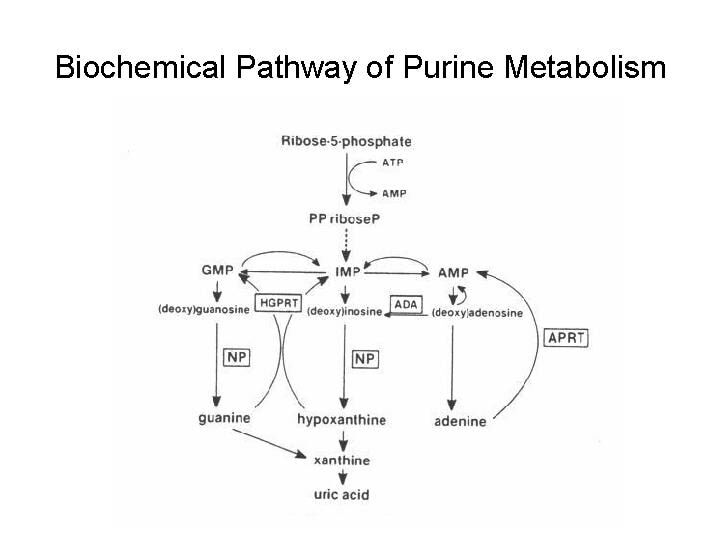 Biochemical pathway of purine metabolism. AMP = adenosine monophosphate, APRT = adenine phosphoribosyltransferase, GMP = guanosine monophosphate, HGPRT = hypoxanthine-guanine phosphoribosyltransferase, IMP = inosine monophosphate, NP = nucleoside phosphorylase, PPriboseP = 5-phosphorylribose-1-pyrophosphate.